Etouffee is a smothered rice dish popular with Louisiana’s Cajuns. 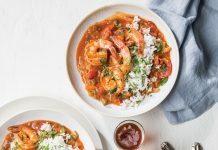 This Zydeco Shrimp Etouffee will quickly become a family favorite. In a large Dutch oven, cook bacon until brown and crisp. Remove and drain on paper towels, discarding grease. In the same pan, add roux, and warm over medium heat, stirring constantly. Once simmering, add onions, bell peppers, celery, and garlic. Cook over medium heat, stirring often, until vegetables are tender, about 5 minutes. Add tomatoes and red pepper purée, and cook, stirring occasionally, 4 to 5 minutes. Add Averna, stock, 2 tablespoons Zydeco Spice Mix, bay leaves, and salt. Bring mixture to a boil over medium-high heat. Reduce heat to medium, and simmer, stirring occasionally, 35 to 40 minutes. In a medium bowl, combine shrimp, and olive oil. Add remaining 2 tablespoons Zydeco Spice Mix, stirring to coat shrimp well. Heat a nonstick skillet over medium-high heat. Add medium shrimp, and cook until pink and fi rm, 3 to 5 minutes. 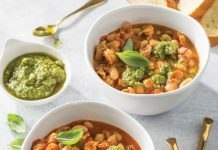 Remove from pan, and add to étouffée. To the same skillet, add large shrimp, and cook until pink and fi rm, about 8 minutes. Set aside. Remove and discard bay leaves. 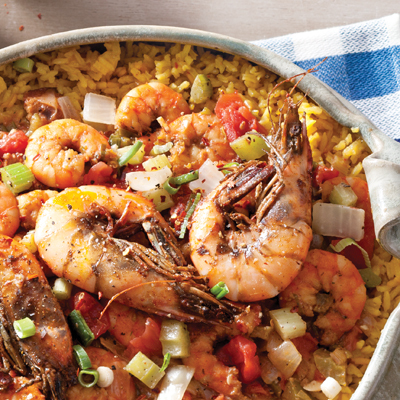 Serve étouffée over cooked yellow rice, and top with large shrimp. Garnish with chopped green onion and reserved bacon, if desired. *Vermouth or anise-flavored liqueur may be substituted for the Averna. Reduce heat to low, and continue cooking, whisking, until fl our has lost its raw smell, but before any golden color or toasted aroma occurs, 4 to 5 minutes. For blond roux, continue cooking, stirring occasionally, until roux is light golden brown, about 15 to 20 minutes. For brown roux, continue cooking, stirring occasionally, until roux color resembles peanut butter, 30 to 35 minutes. For dark brown roux, continue cooking, stirring occasionally, about 45 minutes. As roux darkens, stir more frequently. 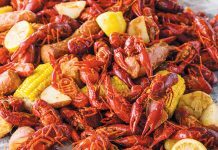 In the work bowl of a coffee or spice grinder, combine crab boil, peppers, thyme, garlic salt, onion powder, and smoked paprika. Pulse until mixture is finely ground. Store in an airtight container up to 2 weeks.